Description: So new that the wheels haven't even had time to rust, 2777 is fresh out of the shops in Atlanta and northbound in a mixed freight to Chattanooga. Description: As the sun breaks through the clouds a westbound stack train knocks the signal down at CP-192. Description: Eastbound on track one passing through CP Pack with two brand new SD70M-2s. Description: After holding the main on Pattenburg Tunnel's west side for NS 21M, 24V is once again on the move. 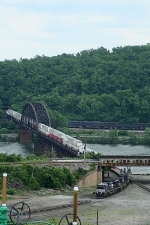 Description: 3 SD70M-2's pull the grade at Horseshoe Curve with a long stack train. Description: 3 SD70M-2's pull a long stack train up the mountain at Horseshoe Curve. 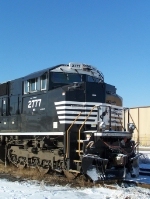 Description: 24Z comes out of the yard behind an M2/8W duo. Description: ...left behind from an earlier train, Musconetcong Tunnel, 1345 hours. Description: NS 2777 leads an intermodal into Easton on a humid July morning. Description: This train's symbol is unknown. Description: NS GEVO #2777 passes the new westbound signal at CP Potter in Edison on its way east to Oak Island Yard on Sunday, August 5th. The eastbound signal mast was lying on the ground awaiting installation.